Critics of globalization claim that economic liberalization leads to a lowering of regulatory standards. As capital and corporations move more freely across national boundaries, a race to the bottom results as governments are forced to weaken labor and environmental standards to retain current contracts or attract new business. The essays in this volume argue that, on the contrary, under certain circumstances global economic integration can actually lead to the strengthening of consumer and environmental standards. 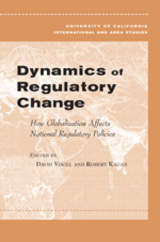 This volume extends the argument of David Vogel’s book Trading Up, which discussed environmental standards, by focusing on the impact of globalization on labor rights, women’s rights and capital market regulations. David Vogel is the George Quist Chair of Business Ethics at the Haas School of Business and a Professor of Political Science at the University of California, Berkeley. His recent publications include Trading Up: Consumer and Environmental Regulation in a Global Economy and Benefits of Barriers? Regulation in Transatlantic Trade. Robert A. Kagan is Professor of Political Science and Law at the University of California, Berkeley. His most recent books are Adversarial Legalism: The American Way of Law, Regulatory Encounters: Multinational Corporations and American Adversarial Legalism, and Shades of Green: Business, Regulation, and Environment.